Chester Alan Arthur was in the White House, and Franklin Delano Roosevelt was napping in a nursery in Hyde Park, New York. FDR, after all, was only one year old at the time. Horse-drawn carriages ruled the roads—and in New York City they also reigned supreme on the just-completed Brooklyn Bridge. 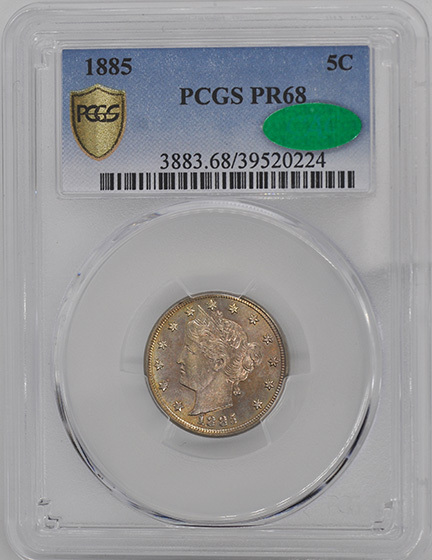 The year was 1883, and one year after FDR’s arrival in that nursery, the United States Mint was busy giving birth to a “baby” of its own: the Liberty Head five-cent piece. The father of the new coin was A. Loudon Snowden, Superintendent of the Philadelphia Mint. Snowden believed that the nation’s three minor coins—the cent, three-cent piece and five-cent piece—should be uniform in design and metallic composition. In 1881 he directed Chief Engraver Charles E. Barber to prepare suitable sketches for these denominations, with all three to feature a classical head of Liberty. Barber completed the task late that year, and trial strikes were made of the three coins. All were very simple in design, with the Liberty head on the obverse and a Roman numeral—I, III or V—on the reverse within a wreath, signifying values of one, three and five cents, respectively. All were struck in copper-nickel, the same alloy being used already in the three-cent piece and the Shield nickel. It soon became apparent that Congress would oppose a change in composition for the cent, which was made of bronze. Furthermore, the Treasury would not permit a design change for the three-cent piece. That left only the five-cent piece, and Snowden and Barber concentrated on overhauling it. The Shield nickel, introduced in 1866, was the first base-metal five-cent piece in U.S. history; up to then, the half dime—a small silver coin—had filled the nation’s need for that denomination. Though reasonably well accepted, the Shield nickel was hardly untouchable; its stark, bland design made it a prime candidate for remodeling. And its newness didn’t protect it from replacement: At that time, there wasn’t yet a federal law establishing a minimum life expectancy for U.S. coin designs. 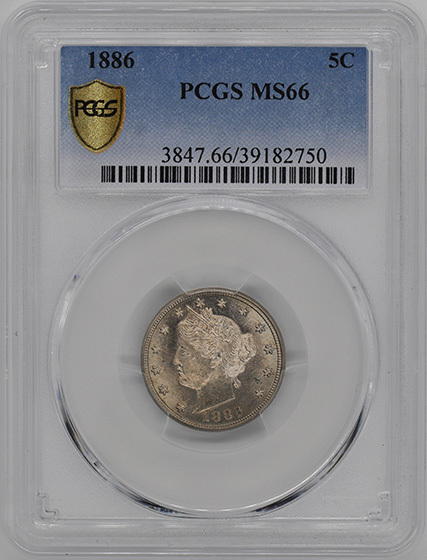 Snowden admired Barber’s new design, and he also welcomed the change because it gave him a chance to increase the diameter (and thus reduce the thickness) of the nickel. He believed that this would lengthen die life dramatically. Snowden proudly unveiled the Liberty Head nickel at a special ceremony on January 30, 1883. Dignitaries attended, and souvenirs of the first strikes were distributed to the guests. Regular coinage began later that week—then suddenly the celebrating stopped. The first “V” nickels had barely left the Mint when appalled officials found a fundamental flaw in their design: Barber had omitted the word CENTS. His oversight soon created a crisis for Uncle Sam: Confidence artists were plating the nickels with gold and passing them off to unsuspecting merchants as five-dollar gold pieces. They were, after all, virtually the same size as half eagles. As brand new coins, they were still unfamiliar to the public, and they lacked any statement of value beyond the letter V—which, of course, could represent either five cents or five dollars. 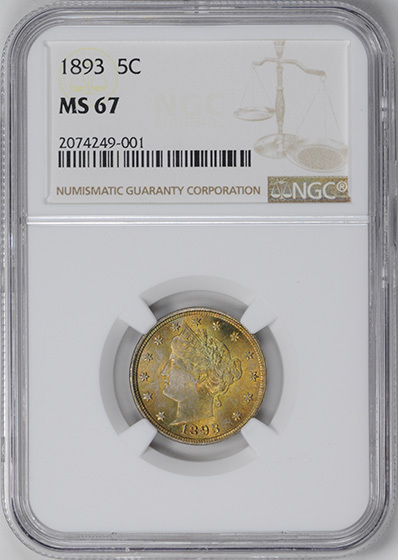 Barber quickly prepared a new design, this time placing CENTS in big, bold letters below the V. By then, however, the Mint had struck nearly 5-1/2 million of the so-called “No CENTS” nickels, and many had been gold-plated and passed. Even today, it isn’t uncommon to find these “racketeer nickels” in hoards and collections. Their value as collector’s items is small, but they hold great appeal as historical curiosities. 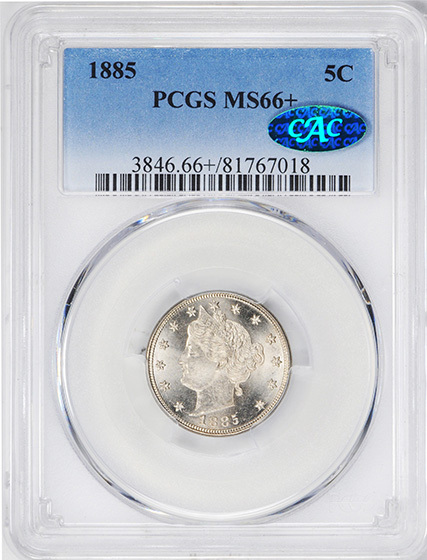 By the end of 1883 the Mint had produced more than 16 million nickels with CENTS on the reverse, but the “No CENTS” variety is far more common today in choice condition. Many people set examples aside, mistakenly believing that, having been replaced, these would someday be rare. 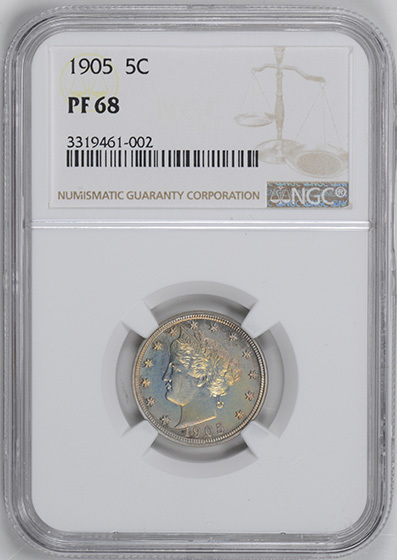 Following all the drama surrounding its introduction, the Liberty Head nickel settled down to a sedate existence and one more befitting its role as a coin of the realm in the late Victorian Era. 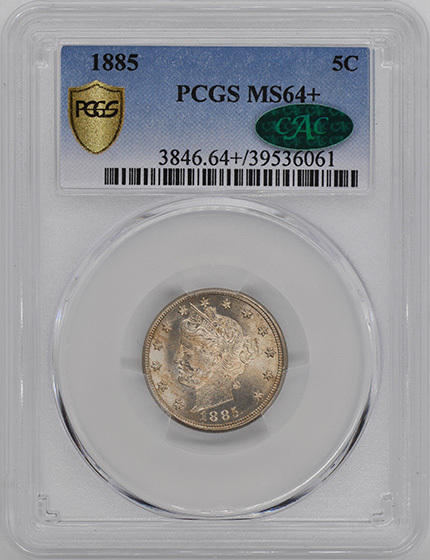 There were no significant further changes in its simple, straightforward design and, for all but the final year, there were no branch-mint issues to complicate matters, either; the Philadelphia Mint produced the entire mintage except in 1912, when Denver and San Francisco struck the coin as well in its last official appearance. (The mint mark appears to the left of the word CENTS on the reverse). 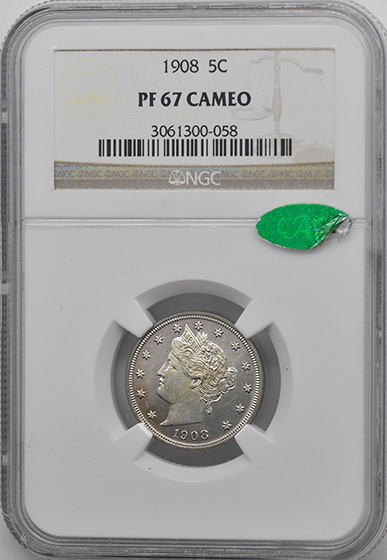 There are low-mintage issues—notably 1885, 1886 and 1912-S—but there are no great rarities; 1912-S, at 238,000, is the only coin with a mintage below a million. At the other extreme, not one V nickel topped the 40 million mark; 1911 is the highest with just over 39.5 million. 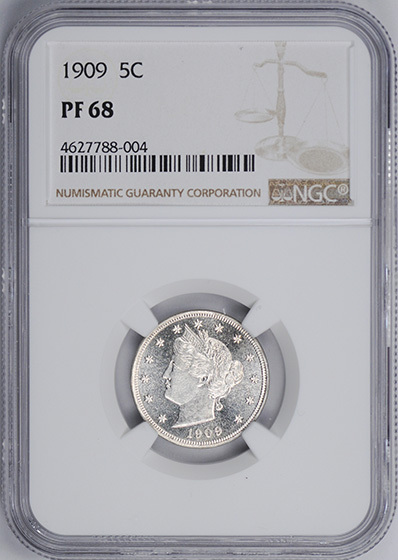 Although it covers 30 years, the Liberty nickel series is a compact and potentially completed set, largely because of the near total lack of branch mint issues. For that reason it’s widely collected by date and mint, though many do collect it simply by type. Proofs were made in every year, always in the thousands, a high level for that period. Due to their low relief, Liberty Head nickels are generally available well struck; the lower-left portion of the wreath may be a bit soft, due to its being directly opposite the highest relief of Liberty’s bust. Made in large numbers, these coins are readily available in very high grades. Points to check for wear are the hair above Liberty’s ear and the wreath and corn ears on the reverse. In 1913 the Liberty Head design gave way to the Indian Head/Buffalo type. No Liberty nickels were made of that date officially, but some years later collectors were stunned to learn that five 1913 examples had surfaced—all of them apparently made on the sly by someone at the Philadelphia Mint. 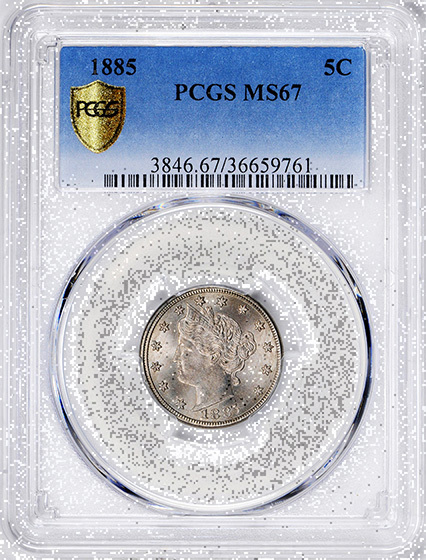 Despite their clouded origins, these came to be accepted as legitimate collectibles, and they now rank among the most coveted and valuable of all U.S. coins. 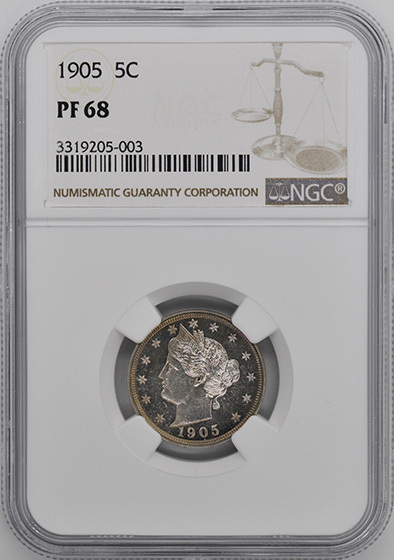 In 1996 the Eliasberg Specimen, considered the finest of the five, became the first United States coin to top one million dollars at auction. Controversy marked both the birth and the demise of the Liberty Head nickel. 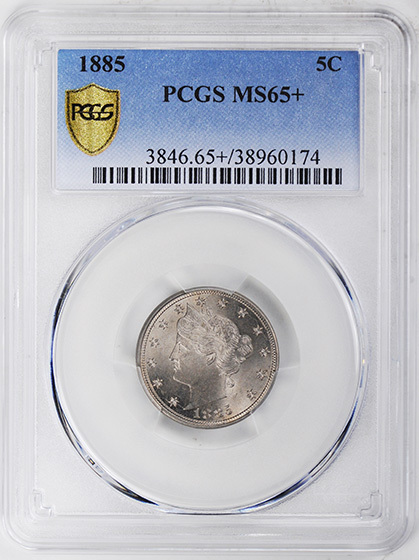 There’s no disputing one thing, though: This is a coin with exceptional appeal for collectors.